Definitely the best soup I have ever made – possibly even eaten. Now the weather is getting colder there’s nothing like coming home to a warm bowl of comforting soup. Leave your myfitnesspal accounts at the door though people, because this was calorific and filled to the brim with the carbs. Great if you’ve been out at university all day studying and in need of something warm and comforting! I’m going to post the recipe below and I think it was quite simple but was a bit labour intensive because you had to stand and stir it pretty much the whole time – if you don’t it’ll split or burn on the bottom. Also if you don’t have floury potatoes to help the soup thicken, mix a small teaspoon of cornflour with 25ml of water (until it’s nice and runny) and stir this into the soup towards the end – it thickens up in no time – just make sure you stir it straight away when you add it because it can make lumps! The fun thing about soup is that really, most of the time, you can add whatever you like and it still tastes pretty good! 2 x Jacket potatoes or 450g (ish) of potato equivalent of your choice! 1. Finely chop the bacon, dice up the potato and onions. Cook the bacon in a large saucepan for about 4 minutes until it is cooked and beginning to brown slightly. 2. Add the olive oil, potatoes and onions. Cook for 12 minutes stirring constantly. Keep an eye on it at this stage because it would be easy to catch it and burn on the bottom. 3. Add the stock and milk. Bring it to the boil the and then reduce the heat right down to a simmer. Simmer for 10 minutes, add the pasta and simmer for another 10 minutes. 4. Add in the cream, simmer for a few minutes to get it back up to temperature. Add the pinch of pepper and stir in the pesto. 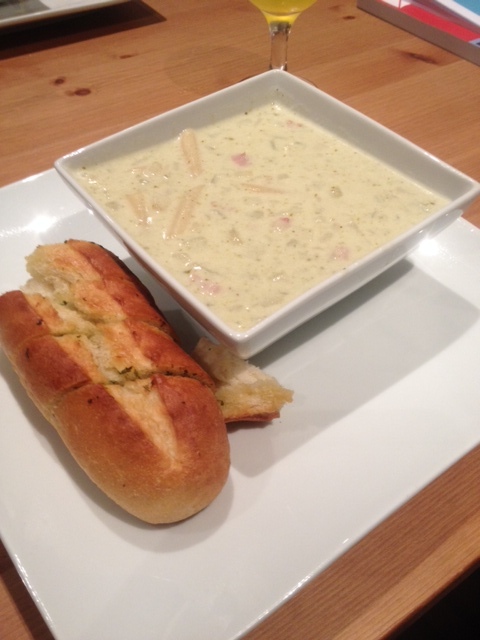 Serve in individual soup bowls with garlic bread and a sprinkle of parmesan on top if using.